EUR/USD: Wave analysis and forecast of 08.08 – 15.08: The pair is undergoing correction. Downtrend dominates. Estimated pivot point is at the level of 1.3450. Our opinion: In the short-term: sell the pair from correction above the level of 1.3330 with the target o 1.3450. In the medium-term: sell the pair from correction below the level of 1.3450 with the target of 1.32. Alternative scenario: Breakout of the level of 1.3450 will allow the price to continue the rise up to the levels of 1.3500 – 1.3550. Analysis: Presumably, the formation the third wave (iii) of the bearish momentum has completed. Locally the formation of the fourth wave has begun (iv). If this assumption is correct, after its completion the pair will continue to decline to 1.32. 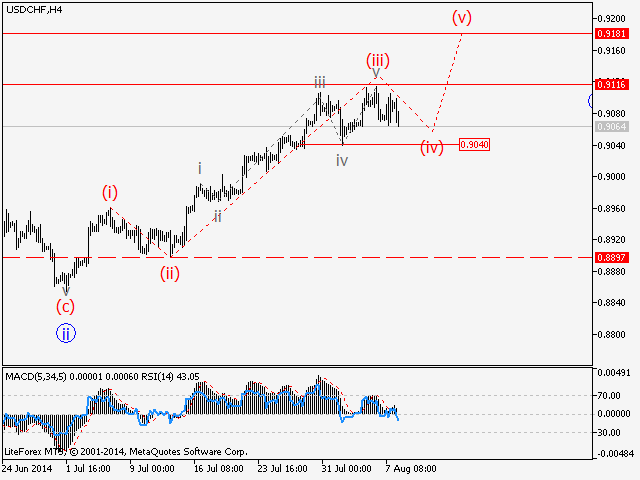 USD/CHF Wave analysis and forecast for 08.08 – 15.08: Uptrend continues. Locally the pair is experiencing correction. Estimated pivot point is at the level of 0.9040. Our opinion: Buy the pair from the correction above the level of 0.9040 with the target of 0.9180 – 0.92. Alternative scenario: Breakout of the level of 0.9040 will enable the pair to continue the decline to the levels of 0.90 – 0.8950. Analysis: Presumably, the formation of the upward momentum in the third wave (iii) continues. Locally, “bearish” correction in the fourth wave (iv) is being formed. If this assumption is correct after the completion of the correction the pair will continue to rise in the fifth wave to the levels of 0.9180 – 0.92. USD/JPY Wave analysis and forecast for 08.08 – 15.08: Correction continues. The pair may go up. Estimated pivot point is at the level of 101.00. Our opinion: Buy the pair from correction above the level of 101.00 with the target of 104.10. Alternative scenario: Breakout of the level of 101.00 will allow the price to continue the decline to the level of 99.50. Analysis: On the daily timeframe it is not excluded that the formation of the horizontal correction as the wave (B) is ongoing. At the moment it is likely that the wave (C) is being formed, within which diagonal triangle can be formed. Locally, it seems that the wave iv of (C) is nearing completion. If this assumption is correct, the pair will continue to rise up to the level of 104.10. Critical level for this scenario is 101.00. 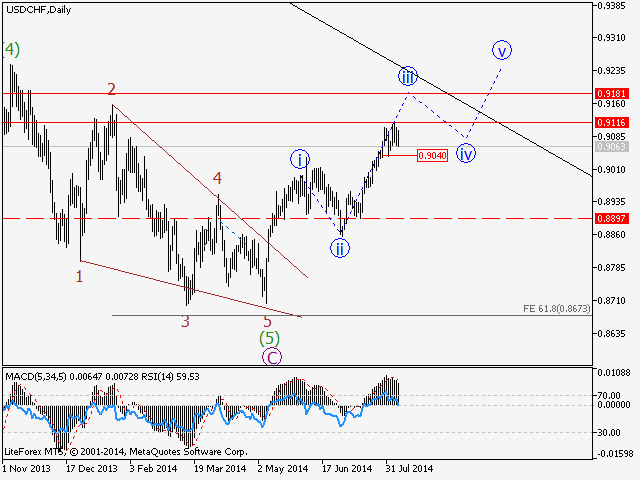 USD/CAD Wave analysis and forecast for 08.08 – 15.08: The pair is likely to grow. Estimated pivot point is at the level of 1.0880. Our opinion: Buy the pair from correction above the level of 1.0880 with the target of 1.10 – 1.1050. Alternative scenario: Breakout of the level of 1.0880 will allow the pair to continue the decline to the level of 1.08. Analysis: Presumably, the formation of the ascending momentum in the third wave (iii) has completed. Locally correction is being formed in the fourth wave (iv). If this assumption is correct, after the completion of the correction, the pair will continue to grow in the fifth wave to the levels of 1.10 – 1.1050.